An easy way from medical professionals to manage theirappointments, tasks and patients while on the go.This is the Betarelease of our MedMob app. There is a chance bugs or other issuesmay arise. We would love you feedback and suggestions which can besubmitted through the app in the Settings tab underfeedback.--Simple. Easy to Use--Our aim is to make MedMob as simpleand easy to use as possible. Everything is done with userexperience and interaction, in mind. And, while being easy-to-useis important, we also want it to be attractive so that your enjoyusing it.--Information. When and where you need it--MedMob givesyou immediate access to the information you need, at the time youneed it and where you need it. Viewing your next appointment whenyou are out of the office or travelling between home visits. Keeptrack of your follow ups and tasks with fast task lists. Patientlists so you can get fast access to the patients you need to. Allbacked by a growing electronic medical record (eMR) to store allthe clinical information you need on a patient.--Secure. Safe fromprying eyes--All data is kept in your control on your phone,secured by the latest encryption technologies.--Ready. For yourspecialty--Behind most information on MedMob is the patient. And tohelp you improve the health of your patients or prevent degradationof their health MedMob has a growing electronic medical record(eMR). If you have a clinical speciality we’d love to partner withyou to build your eMR needs into MedMob. How tall will I be? How tall will my child be? This is a children'sadult height prediction calculator based on the linear regressionanalysis method based on the Khamis-Roche Research. Solve ratios for the missing value when comparing ratios orproportions (2-4 values) and apply to rations to other data sets.Suggestions welcome. Calculated based on optimal reward algorithms, this app predictsthe best time to propose to your partner. Using similar algorithmsused Medicine and Finance predict the right date to maximiserewards and minimise costs this app helps you take the emotion outand use maths to predict the right time to start getting serious. ★ Top Developer (awarded 2011, 2012, 2013 and 2015) ★ Euchre Free –the popular contract trick-taking card game for 4 players, broughtto the Android market by AI Factory – is developed to the same highstandard as the rest of our apps with an easy-to-use interface,smooth gameplay on all handsets, clear stylish graphics andindividual CPU player “styles”. All you’ll ever need for Euchre!Featuring: - 18 CPU Euchre players of varying skills and styles(beginner to expert) - Choose who to partner with and who to playagainst - Stick the Dealer, Turn it Up to Dealer, Canadian Lonerand target score options - 3 different decks of cards available -Choice of backgrounds, or use your own photos! - User stats withand against all players - Undo & Hints - Euchre Rules &Help - Designed for both Tablet and Phone This free version issupported by 3rd party ads. Ads may use internet connectivity, andtherefore subsequent data charges may apply. The photos/media/filespermission is required to allow the game to save game data toexternal storage, and is sometimes used to cache ads. If you like Hearts, Euchre, or Canasta, you will love CallBreak(Spades). CallBreak is a popular card game in Nepal and India thatis now available on Google Play Store. This game is a brain teaser:it will provide tons of mental exercise while providing hours ofentertainment and fun. You can also play another popular game,Jutpatti, through our app. This game requires quick thinking and isequally as entertaining and fun. CALLBREAK The origins of CallBreakis unknown, but many believe it is derived from the trick-basedgame Spades. CallBreak (also known as Lakdi/Lakadi) is a popularcard game in Nepal and India. In CallBreak the term "hand" is usedinstead of trick, and "call" is used instead of bid. After eachdeal, each player has to make a call for the number of hands he/shecan capture, and the objective is to capture at least that manyhands in a round and try to break another player, i.e., stop themfrom getting their call. Deal & Call CallBreak is a four-playercard game with the spade as the trump card. CallBreak uses astandard 52-card deck. There are five rounds of play (deals) in agame. The first dealer is chosen randomly, and then cards are dealtcounterclockwise from the first dealer. Each player gets 13 cards,and then the game begins with each player calling their possiblewinning hands. The first player to place a call is the player leftof the dealer. After the first player places their call, calls aremade in a counterclockwise rotation until all four players haveplaced their calls. Game Play After the calls are placed, theplayer next to the dealer makes the first move. The first playerthrows any card, but the suit thrown by the first player will bethe lead suit. The other three players must follow the same suit.If the remaining players do not have this suit at all, they mustbreak this by the trump card (which is the spade card of any rank).If they do not have a spade of any rank, they can throw any othercard out. The highest card of the lead suit wins the hand, but ifthe lead suit was broken by spade(s), then the highest ranked spadecard will capture the hand. The winner of the hand leads the nexthand. This continues for 13 hands after which the next deal begins.Points After each round, each player gets a points update. If aplayer captures at least as many hands as his/her calls, the playerreceives a point for each hand. If the player captures extra hands,he/she receives one-tenth of a point (0.10) for each extra hand.For example, if a player places a bet for three calls and capturesfour hands, he/she will be given 3.1 points. However, if a playerdoes not capture at least as many hands as his/her calls, theplayer receives a negative point for each hand. For example, if aplayer places a bet for four calls and captures two hands, he/shewill be given -2 points. Result At the end of the fifth round, theplayer with the highest points wins the game. JUTPATTI Jutpatti((जुटपत्ती) is one of the easiest games you will ever play and isprobably the first game people learn to play in Nepal and India.The rules are simple. Jutpatti is a card game that is played withan odd number of cards (5, 7, 9, 11). After each player is dealtthe required number of cards in a hand, the top card of theremaining deck determines the ‘joker.’ Each player now has to makecard pairs so that each pair equals the ‘joker’ number. Until thepairs are made, players throw out cards, fetch cards from the deckor grab cards thrown out by other players. The player who can makeall of their cards into pairs first wins the game. JOIN US Join thegrowing community of CallBreak and Jutpatti players. Play with yourfamily and friends (on the same network) in the multiplayer mode orplay with our talented group of bots in the single-player mode.Download this free card game today and play CallBreak and Jutpattianytime, anywhere. Spider Solitaire is one of the most popular Patience games. With afocus on convenient gameplay our Spider Solitaire game is probablythe best spider solitaire for your Android phone or tablet.Download Spider Solitaire and you will feel the difference! Thiscard game features: - 1 suit, 2 suits, 3 suits and 4 suits games -Smart controls and auto-complete - Customisable cards andbackgrounds - Game speed controls - Detailed statistics - Landscapeand portrait support Play Spider Solitaire with comfort! Spades is a popular trick-taking card game like Hearts, Euchre& Canasta, but this Multiplayer card game is played in 2 playerteams which adds a total new element of strategy. In Spades, Acesare high and Spades are trump which is where the game gets itname.Hardwood Spades Free breathes new life into your favorite cardgame with excellent graphics and soothing environments. If you'renew to the game, don't worry you can find how to play with ourtutorials. You can play Hardwood Spades not just on your phone ortablet but on your computer and even your TV as well!Play Spadesonline with players from across the internet or with family andfriends. You can even post your winnings to Facebook for all yourfriends to see.Game variations included:* Partnership * Partnership- Suicide* Partnership - Mirrors* Individual (solo)* Individual-Mirror * Individual-Cutthroat * Individual -Cutthroat MirrorUpyour game, and test your skill in Tournament play. Full integrationwith Tourney King tournament service, allow you to play in or runtournaments of your own! Win prizes and glory in Showdowntournaments where winners of previous tourneys face off in a battleroyal to crown the best.Online Multiplayer social games are free toplay.We've got spades plus other card and boardgames:HardwoodEuchre - Jacks are Trump in this trick taking game.Hardwood Hearts- A great trick taking game where the goal is to take the leastamount of points.Hardwood Backgammon - Who can move their men tosafety 1st?& Video Poker Duel - Play competitive video pokerjust like you'd find in a casino.If you also like some solitude,all of our games can be played as single player with multipledifficulty levels. 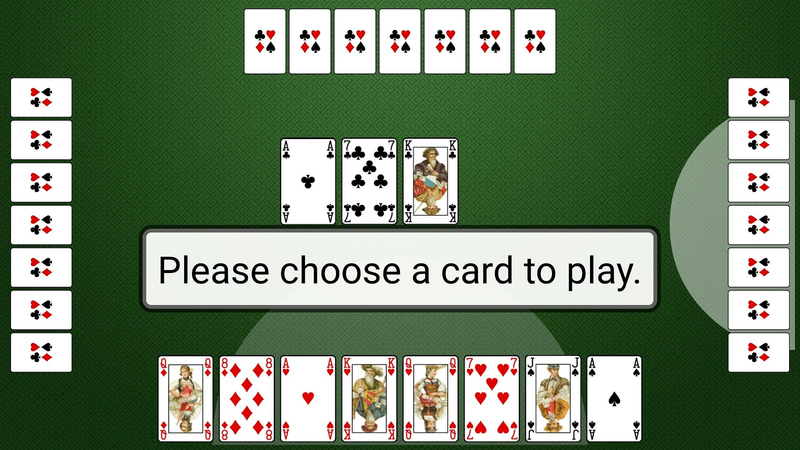 But for the ultimate single player experience,check out our game Hardwood Solitaire IV available here on googleplay.